I can swim, but I don’t like deep waters. To be more specific I don’t like being submerged in water where my feet can’t touch the bottom surface. The fear is a mental block that I’m working through. While vacationing in Cancun, Mexico, hubby was fixated on giving our son the opportunity to swim with Dolphins. We asked him if he wanted to do so and without hesitation, he said, “Yeah! I wanna swim with the Dolphins!” I was excited that the two of them would swim together and I would get to take tons of pictures. Fast forward three days later… We’re still confirmed for three. An inner voice in one ear says, “run!” Another voice whispers, “don’t be a chicken___! Go for it!” With great apprehension, I listen to the voice that tells me to go for it. First we are suited with a life vest and wait. I’m a little nervous at this point, but I’m sitting so my fingers tightly grip the bench. I look around the waiting area hoping to connect with another set of nervous and fearful eyes. I don’t find any. Maybe they’re faking it like me. “Group 3!” Oh my goodness, that’s us! There are eight in our group. After we’re instructed to douse our hands with hand sanitizer, we’re escorted down to the next level. Thankfully I’m distracted by my son. He is so excited that he doesn’t hear some of the instructions, so I repeat them to him. We walk until we approach the dolphin tank. Looks like an over-sized pool surrounded by concrete. We’re instructed to remove our footwear and place them in a box. 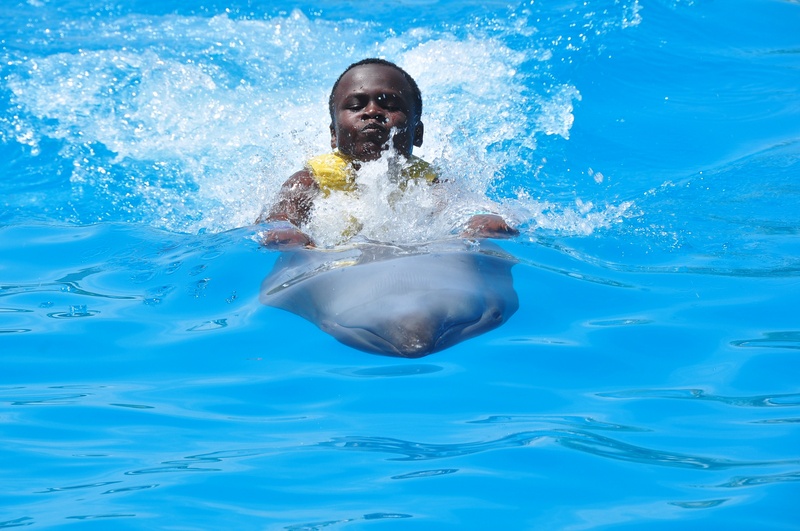 As we do this, we begin to receive instructions on the do’s and don’ts of interacting with the dolphins. “Can everyone swim?” the instructor asks. Umm… “Should I tell her that I can swim, but am terribly afraid of deep waters?” “No… I am wearing a life vest. I think!” I’m so darn nervous I cannot think straight. “Hun, this is a life vest, right?” He looks at me oddly like I just spoke in French. In a single line, we step down into a wading area. The water is about five feet deep. Our feet touch the ground, I am happy. We’re all situated and are instructed to swim toward the middle and place ourselves shoulder to shoulder in a straight line. I look to the right of me and my hubby and son are already out. I step out and my heart is racing harder than I think it’s every done before. Although I am wearing the vest and I can swim, I’m still fearful of drowning, but I try to remember the techniques to swim and slowly catch up to hubby and son. When I turn around and see how far I am away from the platform, I quietly panic. “Scream for help, they will get you out!” “I don’t want to die this way!” I know my eyes are probably bulging like they’re about to pop out. I am so scared! I look over and my son loves it and is full of excitement! “Breathe girl breathe! Come on! You can do this! Breathe!” I calm myself down a bit by talking myself through it and by doing some serious breathing. Our group placed our hands out face down and the dolphin swam slowly just beneath our palms so that we could feel his smooth and slippery skin. Touching the dolphin also helped to calm me. After a few more minutes we swam back to the wading area. Six of the eight in our group were brave enough to take a ride on the dolphin’s belly. I was one of the two who passed on that opportunity. My son was the first to volunteer. I was amazed at how he swam out to the middle of the tank and eagerly waited as the dolphin swam out to him. As instructed he grabbed on to the dolphin’s fins and enjoyed the wild and speedy ride to the waiting area. 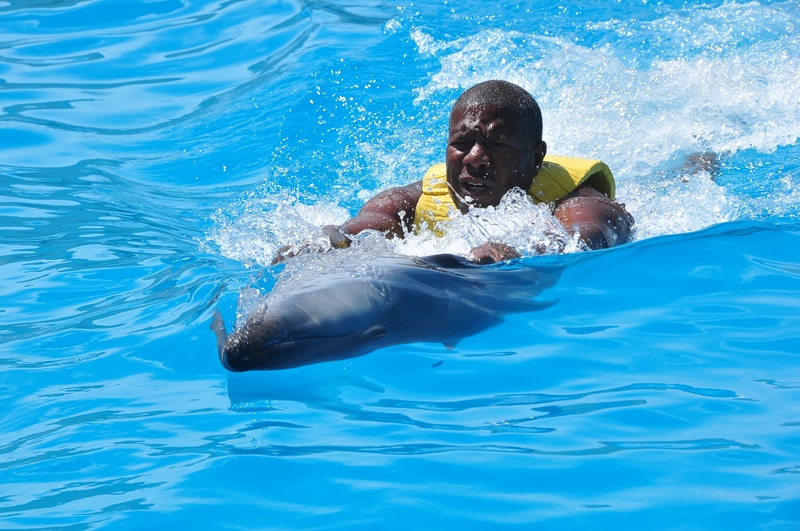 Hubby then took his turn riding the dolphin’s belly. Our son riding the dolphin’s belly! Hubby’s ride on the dolphin’s belly. I did take part in two other cool tricks with my family. Since I didn’t do the belly swim, I was given the chance to do something else. Our guide instructed me to swim away from the wading area again. I swam out a little ways by myself. I felt more at ease this time. Out of nowhere, the dolphin swims around to my left side and kisses me on my cheek. 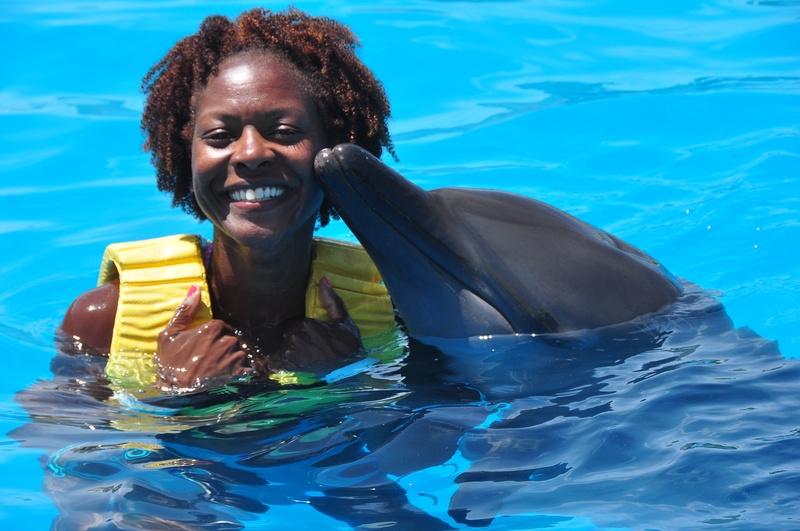 My first kiss by a dolphin! I’m frozen! “Turn and kiss him” she says. My eyes glance left first and I can see him right there! I slowly turn my face to the left and kiss him on the mouth as instructed. Oh wow! That was the coolest thing that I’ve ever done! At that moment, I forgot that my feet didn’t touch the ground and finally relaxed. Would I do it again? Undoubtedly yes!!! I am so glad that I pushed myself through my fear and anxiety and did not give up. I think I was more afraid of the deep waters than I was of the dolphin. So often in life, we give up when it matters most. Running away from our fears instead of facing them head on and ultimately missing wonderful opportunities. Swimming with the dolphin was a reminder of the rewards of pushing myself beyond my comfort zone. Kissing the dolphin on the mouth was something that I never imagined doing and, aside from watching my hubby and son ride the dolphin’s belly, the kiss but was the most thrilling part of my trip. If you get the opportunity to swim with a dolphin, I highly recommend that you give it a try; surprisingly you might like it. This entry was posted in Family Living, Fitness, Inspiration and tagged Dolphin, Dolphin Swimming, dolphin tank, family vacation, fear of deep water, overcoming fears, Recreation, Travel, vacation. Bookmark the permalink. After the death of someone who I cared for dearly, I realized how short life is and decided to live more! While planning for the future has a place in my life, the planning does not guarantee my existence. So I try to take advantage of every day & enjoy myself with my loved ones. Thank you!! Yes this was the best and funniest yet!!! I truely enjoyed it and I will live that experience still through you!! Great story Tom!!! Thanks Bob! Although it was nerve wrecking, it was well worth it. It was also an opportunity to push myself pass my comfort zone. Whew!